What I really like about the Wellington stretch of Te Araroa is all the on/off points. I don’t have to walk for 30km if I don’t want to – I can just go for a couple of hours, starting at one railway station and ending at another. That’s what I did today. I started in Waikanae, and walked along the Waikanae River to the coast. It was a really pretty little path, with lots of access points to the local roads. I was pleased to see that heaps of people were out using it – walking, cycling, swimming, with their families and dogs. And the vegetation was particularly interesting: at first there were heaps of wild flowers, in all shades of purple. And yet as I got closer to the coast, the plants began to change – instead of flowers, there were layers upon layers of flax, toi-toi, and my favourite tree, the cabbage tree. Towards the mouth of the river, I entered into the estuary, keeping very carefully to the boardwalk (as instructed by both Te Araroa and DOC), because apparently there’s quicksand there and I don’t particularly want to be sucked to a nasty death. 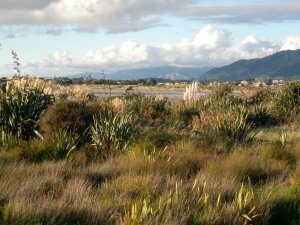 After getting out of the estuary, all limbs intact and none hacked off and left behind to the greedy ground, I wandered down Paraparaumu North beach and into the township, ready to get an ice-cream and head back home after a very enjoyable and desultory walk.